"Bifold doors will add a touch of class or style to any bar and are installed in high class, trendy bars up and down the UK. If you are looking to add the WOW factor to your bar and stand a cut above the competition, bifold doors offer the perfect option"
Unify your indoor and outdoor space, creating the ultimate in alfresco socialising space for your guests. Aluminium bifolding doors can replace entire walls, offering a superb solution for maximising floor space and unifying your indoor/outdoor spaces to create the ultimate dining space for guests. Bifold doors provide the opportunity to enjoy the great outdoors, flood your bar with additional light and space while giving your bar the 'WOW' factor over the local competition. Let your guests socialise in the comfort of the great outdoors. If the weather is good, slide open the bifold doors and offer guests the opportunity to dine alfresco style whilst enjoying the summer sun. Bifold doors offer protection against the elements whilst letting guests enjoy the best of the British weather. The slimline aluminium bifold frames are robust yet light and allow a large surface area of glass. 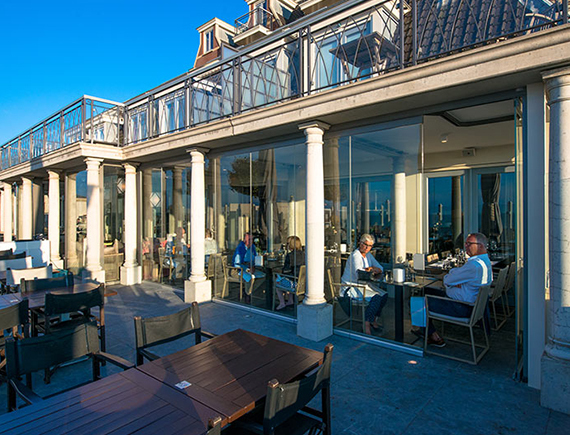 Thanks to the large glass surface area, bifold doors will flood your bar with natural light throughout the day.